The Flite Test Mini Sportster is a smaller more agile version of the larger Swappable Sportster. It is a basic 4 channel plane that is capable of most Sport aerobatic manuevers. Couple this airframe with our Power Pack F for recommended performance. Overall, I like the kit and how it flies. I fly it with the A flight pack and motor suggested, but only a 450mah battery, as I can't find a 850mah as suggested right now. Plenty of power for it, and flight time is still plenty good. Half throttle flying most of the time works well. I was amazed this plane handles windy conditions fairly well, probably due to the weight. When power goes off, it will come down fairly quick, so don't expect a super long glide, you need to aim for the runway and dive to keep speed up to the ground, level off and land. Using the adjustable reflex, the ailerons can also be used as flaperons, to extend the glide a bit. First flight was perfectly straight and required no trim; however, I find it very advantageous to always rig my ailerons for adjustable reflex. So, since it has two servos for ailerons, and I use a Taranis radio, I program a 5th channel to allow me to trim the ailerons up or down, together, to adjust the reflex and that does wonders to really dial in the trim for a level flight, and good loops and rolls that don't fall out. I also use differential ailerons with 80% down, 100% up. Which makes for good rolls. With rudder also applied, it can do a snap roll really fast. I use Williams Brothers Golden Age 2-1/2" wheels, and she can take off and land on grass easily. I hold full up for the take off all the way, then let off once in the air. It won't stall on take off given the amount of elevator throw that is set up, using the guide tool for the throw. In construction, as probably with any foam board, be careful doing the wing fold over to create the airfoil, as one can accidently pop the foam from the paper if you don't support it right on the score lines while folding. 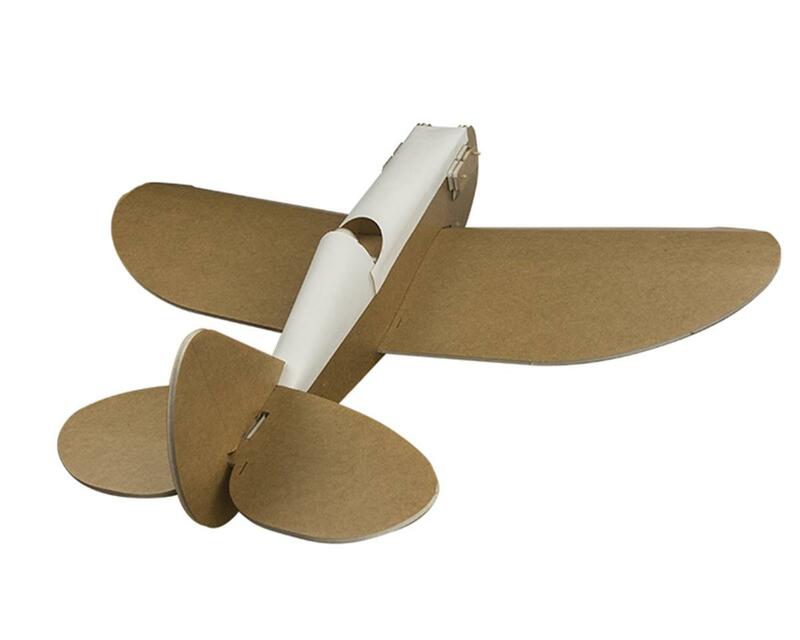 In consideration of making other kits, and using the same motor box, the manufacturer should consider making a hole pattern for the bamboo sticks that hold it into the fuselage. They have such holes in the dummy engine parts. If those aligned to a set in the fuselage, and that pattern was used in other kits, then the motor box could quickly be moved from plane to plane and not end up like Swiss cheese. As they suggest, paint it while still all flat, before building. Manufacturer may want to check the wing slot in the fuselage, as it was very tight. I think it needs to accommodate the flat board of the bottom of the wing more. I also didn't care for the rudder and elevator servo being set behind the cockpit, which has no access once the top decking is glued on. So, I move the locations to just under the cockpit, and now are accessible when I open the hinged top deck. That also helps with the Center of Gravity using the smaller A motor package set, and smaller battery. The little EZ connectors that came with the kit are too big for the servo arms given (to drill a hole to use them would break the arm)and should probably be taken out of the A kit; and, I did the Z bends on both ends of the pushrods, as shown in the instructional video. If in doubt, aim a for a little too long, as you can bend in a central z-ish bend to the rod to make it shorter if needed. I had to do that on one aileron to get it aligned with the other. I also switched to an old Top Flight 7x4 prop, which gave it more thrust than the 6x3 included. A 7x3 might also be worth a try. I got to fly it at Flight Fest in Texas, and although breezy, it handled it very well. I give this little plane a Thumbs up!